Long Island and Cape Cod still look like they will see Earl pass them by to the southeast on Friday (though not by much for Cape Cod). But, the outer banks of North Carolina (Cape Hatteras) has an increasing risk for significant impacts from Earl late Thursday night, and possibly a direct hit. The GFS/Euro models both pretty much have Earl hitting Cape Hatteras, or passing just barely to the east. Earl will weaken a little before he reaches the outer banks, as he will be moving into an area of increasing wind shear and dry air over the next couple days. But, he will still be a dangerous hurricane by Thursday night. Residents that live in the outer banks of North Carolina should take Earl very seriously. Hurricane Earl remains a dangerous category 4 hurricane, with maximum sustained winds of 135 mph. But the good news is he finally made the turn to the northwest last night, and it looks like New England is going to dodge the bullet. 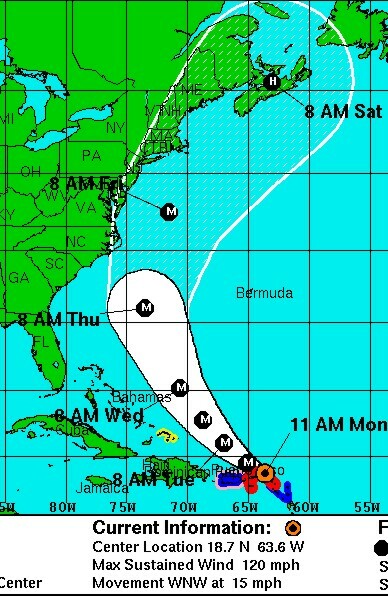 Click here for the latest NHC track forecast. Some computer models still have Earl brushing by the outer banks of North Carolina late Thursday night. So, that area is not out of the woods completely. But, the Great Lakes trough is now forecast to move just fast enough to the east on Thursday to turn Earl towards the north-northeast very early on Friday. Throughout Friday, Earl should accelerate rapidly to the northeast in response to that trough ejecting eastward. This should keep Hurricane Earl to the southeast of Long Island and most of Cape Cod. The only risks left I think are the northwestern eyewall brushing by Nantucket, with gusty winds and heavy rain extending into the southern tip of Cape Cod. This is all good news for coastal New England. If this trend continues, it’ll be good news for the outer banks of North Carolina, too. We still have Tropical Storm Fiona out in the central Atlantic, making way towards the northern Leeward Islands. 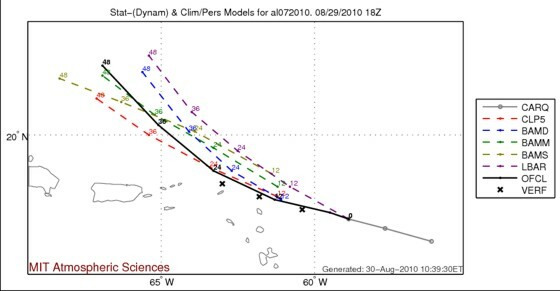 Most computer models and the National Hurricane Center’s forecast take Fiona north of the islands and then out to sea. But, Fiona is weak and hasn’t turned northward yet. If we’ve learned anything from Hurricane Earl’s track, then we should be skeptical of the northwest turn forecast for Fiona later this week. Additionally, Fiona continues to battle dry air, and wind shear is expected to increase a bit over the next couple days. This will keep her from doing any significant strengthening over the next few days. This kind of situation would normally favor a more southerly track than computer models and the NHC forecast indicate. 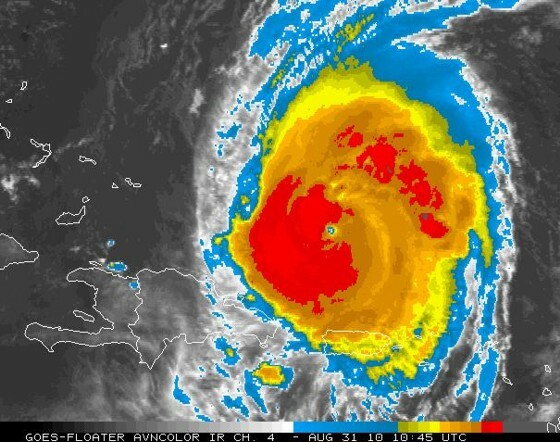 Hurricane Earl rapidly intensified overnight. He now has maximum sustained winds of 120 mph, which brings him to category 3 status. The current forecast from the National Hurricane Center shows him threatening the Mid Atlantic and Northeast coast later this week. But, it’s interesting to note that Earl has been tracking south of the both the official forecast and some of the model guidance for a few days now (shown below). Even if you look at the track forecast history on the NHC website for Earl, you will see how the forecast has shown a northwest turn for several days, yet the turn has still not occurred. Earl's actual track in black with model forecasts in other colors. You can see the north bias in the model. Taking a closer look at the official forecast, the models and Earl’s actual track over the last 24 hours (image below), you can see the continued north/right bias in the models and the official NHC forecast. So the big question is: How much longer will Earl remain south/left of the models and official forecast? If this trend continues for much longer, we will be talking about a direct along the Mid Atlantic or Northeast coast. But alas, it’s just not that simple. 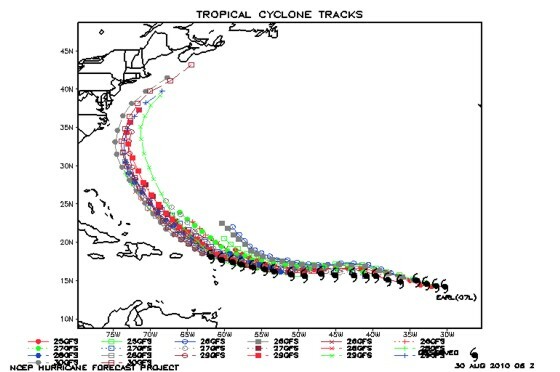 Earls forecast track and actual track in black, with tropical models in other colors. You can see the north bias in the models continues. The other big piece of the puzzles is the timing and speed of a trough forecast to move into the Great Lakes and Northeast late this week. Exactly how it interacts with Hurricane Earl will be crucial in determining how sharp he turns to the north/northeast Thursday into Friday as he approaches New England. Based on the trends of late, it’s going to be a close call for both the outer banks of North Carolina and eastern Long Island/Cape Cod. However, Earl will probably miss just to the east on both accounts, especially for Cape Cod, since that trough is going to play a big role that I don’t think is fully seen in the modeling yet. But it’s going to be a close call and it’s still too early to say either way with confidence. Hurricane Earl Threatens Cape Cod; Fiona a Big Threat to U.S. This has been an interesting hurricane season to watch over the past week. I’ve mentioned plenty of times the abundance of dry air covering much of the Atlantic for quite some time. This has kept tropical storms and hurricanes from showing any significant strengthening for several days into their development. But, as seen from Hurricane Danielle after several days of organizing and some ups and downs in her life cycle, she reached major hurricane status in spite of the dry air. The warm waters and pockets of weak wind shear allowed it to happen – eventually. Now we have Hurricane Earl who is quickly approaching the northern Leeward Islands. Dry air has been a major issue with him (what a surprise), but his center is becoming much better organized, and upper level outlfow is improving by the hour. This is pretty similar to what Danielle went through before reaching major hurricane status. Earl is moving over some very warm waters, and has more warm water ahead of him. Wind shear is also expected to relax over the next coule days. So, it’s no coincidence that he too is forecast to become a major hurricane over the next day or so as he turns northwest in response to a weakness in the Atlantic ridge. Earl will be moving northward by mid week (Sept 1) over the western Atlantic, not far from the Mid Atlantic coast. He will be picking up forward speed and maintaining major hurricane status as he moves over the warm waters of the Gulf stream. Meanwhile, a trough will be approaching the upper Midwest. By Friday, this trough will be moving through the Great Lakes, and will begin to cause Earl to turn towards the northeast. The questions that need answers are how 1)how close to the coast of New England will Earl have reached, and 2) how quickly will that Great Lakes trough eject eastward? The answers to those questions will determine whether or not Hurricane Earl hits Cape Cod or brushes by just to the east. More than likely it’ll be a near miss. But you never know, and it’s too early to be sure right now. There’s another tropical wave that is located over the central Atlantic. I will become a tropical depression or tropical storm within the next day or two. When it does, it will be named Fiona. But, it too is struggling with dry air (big surprise, huh?) and has been having major problems developing a closed low level circulation. Computer models bring the future Fiona to about where Earl is now (near or just north of the northern Leeward Islands) by Wednesday (Sept 1). Then, things get really interesting. Does Fiona turn northwest in response to the weakness in the Atlantic ridge caused by the Great Lakes trough and Earl? Or, does she miss the connection and continue westward toward Cuba and South Florida? Most computer models have Fiona making the connection to the northwest and reaching near the Bahamas by Sept 5. By then, it’s a question of how quickly a new ridge develops over the eastern U.S. The slower the ridge develops the better the chance Fiona hits central Florida to North Carolina. The faster it develops the better the chance Fiona stays further south and hits South Florida or enters the Gulf of Mexico. 00z August 29 European Operational model forecasing a major hurricane on September 6 to hit Florida. 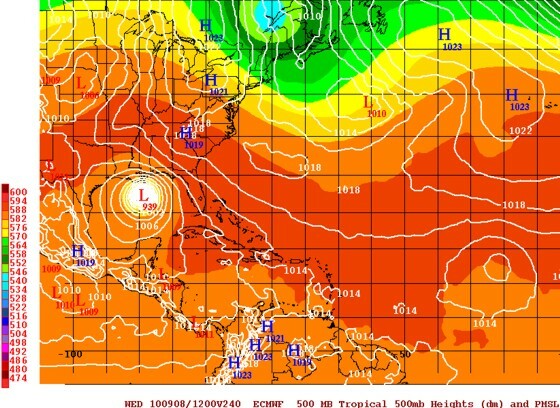 12z August 29 European Operational model takes Hurricane Fiona to the central Gulf on September 7. 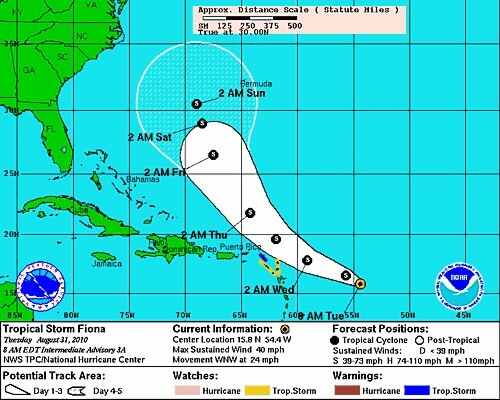 There are a lot of options on the table here with the future Hurricane Fiona. But with the way the pattern is setting up, the warm water temperatures and the weakening wind shear, it looks increasing likely that we are going to have our first major hurricane landfall in the U.S. around Labor Day weekend, or shortly after, anywhere from Florida to the Carolinas. The Gulf coast isn’t out of the woods, either. Stay tuned, things could get really, really interesting. Hurricane Danielle Friday morning, August 27. Maximum sustained winds 135 mph. I don’t really have a whole lot to say except wow, what a beast! Hurricane Danielle really took off over the last 24 hours, becoming a category 4 hurricane with maximum sustained winds of 135 mph. There is still plenty of dry air surrounding the outer bands of Danielle, but it finally came to the point where it just doesn’t matter. Her inner core is extremely organized, and the intense outflow is keeping the dry air from impacting her well defined eye. What a beast. Tropical Storm Earl continues to fight dry air to his west, and hasn’t strengthened since yesterday. Computer models curve him northwest and then north over the western Atlantic next week. But some bring him uncomfortably close to Cape Cod. That could be an interesting situation if models trend further west. But, a trough lifting out of the Great Lakes late next week will help to keep Earl from actually hitting the Cape. The next system near Africa should develop into a tropical storm over the next few days. Some models bring it (next name is Fiona) close to the Mid Atlantic coast in 12 days or so as a tropical storm or hurricane. I know that’s a long way away, and a lot of things can change between now and then. But, it will be something to watch. Satellite image on August 26 of the Atlantic showing Hurricane Danielle, Tropical Storm Earl, and a strong tropical wave coming off Africa. The Cape Verde season has finally begun. After a sluggish start to the Atlantic hurricane season, things are starting to pick up, with two named storms currently in the Atlantic, and more waves coming off of Africa. 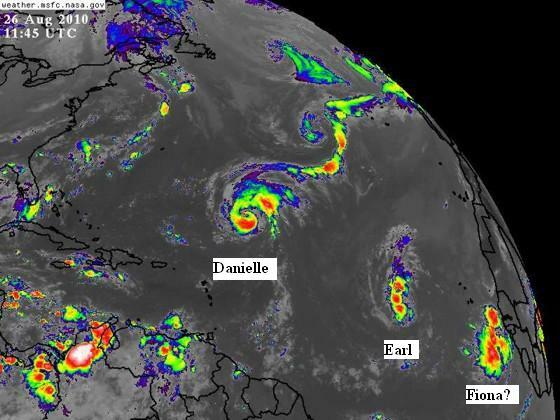 The two named storms are Hurricane Danielle and Tropical Storm Earl. If the wave near Africa develops, it would be named Tropical Storm Fiona. Danielle has been fighting an uphill battle for days, absorbing the abundance of dry air that surrounds the Atlantic waters. This dry air has been one of the main reasons for the slow start to the season, along with wind shear that hasn’t relaxed as quickly as forecast. But overnight and throughout the course of this morning, Danielle’s upper level outflow has blossomed. It’s this outflow that appears to be keeping the dry air well away from the storm’s center, allowing for intensification to occur. 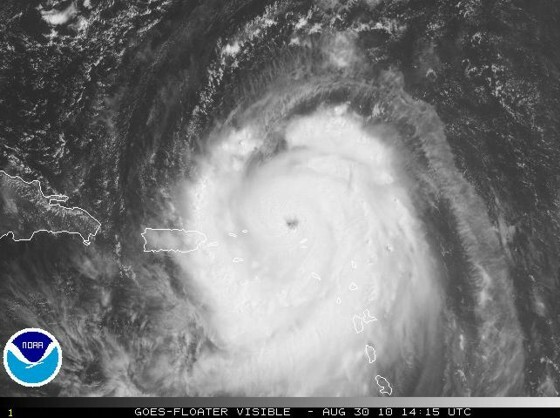 An eye is now visible on satellite imagery. As long as this trend continues, Danielle will become the first major hurricane of the season, if she hasn’t already. 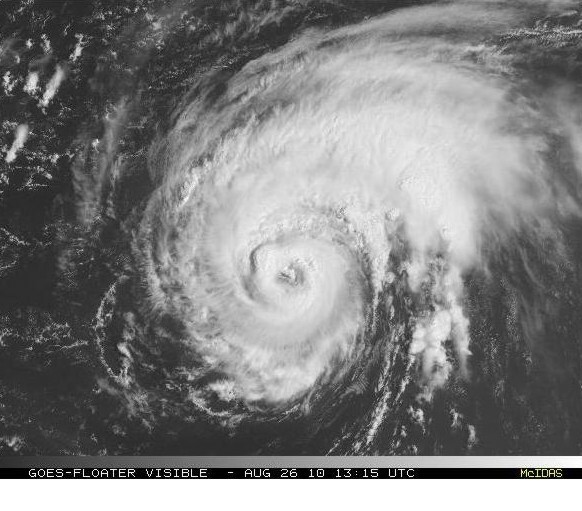 August 26 morning visible satellite image of Hurricane Danielle. 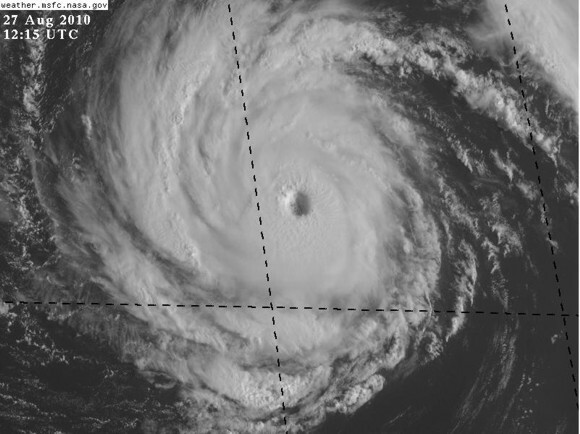 Notice the eye at the center, and the banding structure. This is a visual sign of good outlfow. We have now had a total of five named storms so far this hurricane season, two of which have become hurricanes. This catches the hurricane season up to what would normally occur during a regular season. But, assuming Hurricane Danielle strengthens a little more, she will become the first major (category 3) hurricane of the 2010 Atlantic hurricane season. We don’t typically see the first major hurricane until the first week in September. Let’s not forget that Tropical Storm Earl is forecast to become a hurricane by this weekend. So, if Danielle can reach category 3 status and Earl becomes a hurricane, we will finally be on par with an active season. But, we still have a long way to go to meet expectations set by forecasters before the season started. This active trend needs to continue in the near term, and things will have to be kicked up another notch in the longer term, for any of the seasonal hurricane forecasts calling for 18 named storms to stand a chance at verifying. At least this is a step in the right direction. 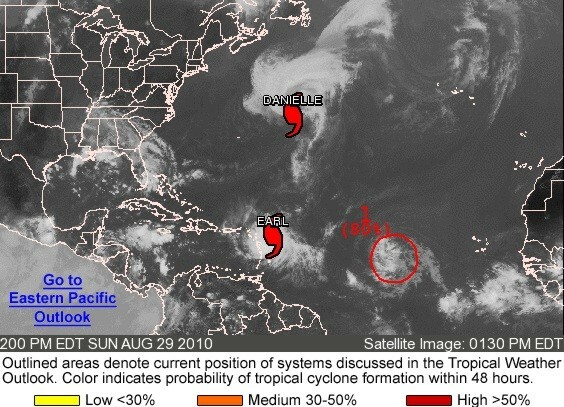 On Sunday, August 22 at 5 p.m. EDT Tropical Depression Four become Tropical Storm Danielle. Then by Monday at 5 p.m. Danielle become a hurricane, with maximum sustained winds of 75 mph. Danielle then moved over very warm waters and rapid intensification occurred. By 5 a.m. EDT on Tuesday, August 24 maximum sustained winds had increased to 100 mph, making Danielle a strong category 2 hurricane. However, dry air surrounded the outer bands of the hurricane, and it was only a matter of time before significant weakening would occur. Then, at 11 a.m. EDT, maximum sustained winds dropped to 80 mph. All the deep convection was almost completely gone, and an exposed center of circulation could be seen beneath a dense overcast. Danielle had ingested a lot of dry air, causing her to weaken. The graphic above is the latest forecast from the National Hurricane Center. They no longer expect Danielle to become a major hurricane, which isn’t really that surprising. Quoting their discussion, “The period of rapid intensification has ended with a thud”. I’m not trying to be critical here, but it sounds like they were caught off guard. From the water vapor image below, you can see an abundance of dry air covering a large portion of the central Atlantic to the west of Hurricane Danielle. It was only a matter of time before this dry air would start to cause weakening. Wind shear also remains an issue, and it seems very unlikely Danielle will become a major hurricane after all. Danielle did undergo a period of rapid intensification, which was very pretty impressive. 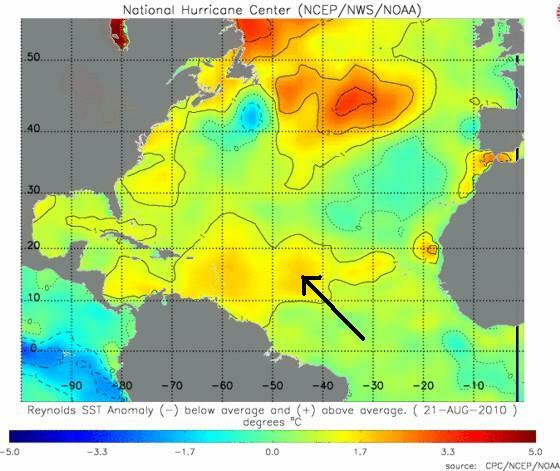 I believe this was possible mostly because of the very warm waters she moved over last night (see image below). But in addition, the wind shear relaxed just enough, and the upper level outflow was strong enough for a few hours to keep the dry air away from the center of circulation and allow the strengthening to occur. Sea Surface Temperature Anomalies August 21. Notice the warm pocket that Danielle just moved over. But this season started slow for a reason, and the driving forces behind that haven’t really changed. Dry air across parts of the Atlantic remain an issue, along with areas of moderate to strong wind shear. It’s really going to take some big changes across the board to catch this season up to the very active season it is suppose to be, at least from Colorado State and NOAA’s forecasts. A waterspout was seen off the coast of Okinawa, Japan on August 19, 2010. Below are links to some spectacular photos of the waterspout. The waterspout lasted about five minutes. On average, waterspouts off the coast of Japan last about 14 minutes. According to a database on tornadoes and waterspouts in Japan from 1961 to 1993, there are 4.5 waterspouts per year in Japan. I found it interesting that according to the database, waterspouts in Japan occur most frequently in October. Waterspouts are different than tornadoes. Waterspouts form during fair and relatively calm weather during the warm season, usually during the day. They develop from the water surface upward, while typical tornadoes form from the cloud base downward. Waterspouts form in light wind conditions, so they usually move very little. If a waterspout moves onshore, it is then called a tornado. Waterspouts typically dissipate rapidly when they make landfall and rarely move very far inland. I’ve never been lucky enough to see a waterspout, but hopefully that will change at some point in the future. They are truly a different breed altogether than tornadoes that I see out in the Great Plains. It’s difficult enough to forecast a tornado, but it’s even harder to forecast a waterspout. They are like the popcorn thunderstorms that form over the southern U.S. in the summertime. I need a really big hurricane or tornado outbreak to happen so that I can discuss that on here instead of waterspouts; sorry guys, the material’s a little weak for now. 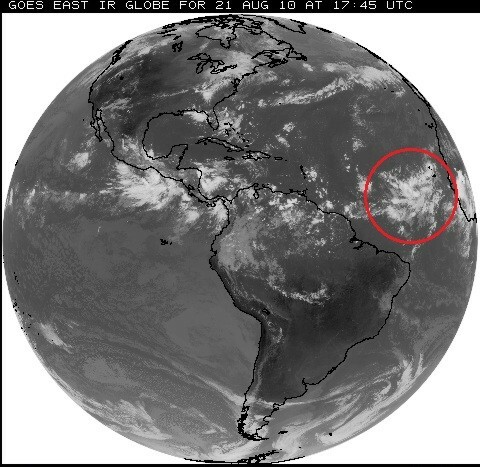 Satellite image August 21, red circle outlines the tropical disturbance that will soon become Danielle. It’s been a while since the Atlantic tropics have shown any life. For the past several days, all global computer models have consistently indicated that a tropical wave would move off Africa into the far eastern Atlantic, and form into a tropical storm. Finally, this tropical wave has generated an are of low pressure at the surface. Showers and thunderstorms have been increasing, and have even begun to show signs of a circulation. This has lead the National Hurricane Center to give this system a high probability of becoming a tropical cyclone within the next 48 hours. Should this tropical disturbance become a tropical storm, it would be Tropical Storm Danielle, the fourth named storm of the 2010 Atlantic Hurricane Season. Below is some of the model guidance, showing the track of this system. As you can see, models indicate the future Danielle will track west-northwest across the central Atlantic over the next few days. By around Wednesday, August 25, models show this system turning northwest to northward and out to sea. This is in response to a trough moving through the northeastern U.S. over the next several days. It will create a weakness in the eastern Atlantic ridge, which is currently driving this tropical system westward. When this weakness occurs, the future Danielle will be forced northward and out to sea. 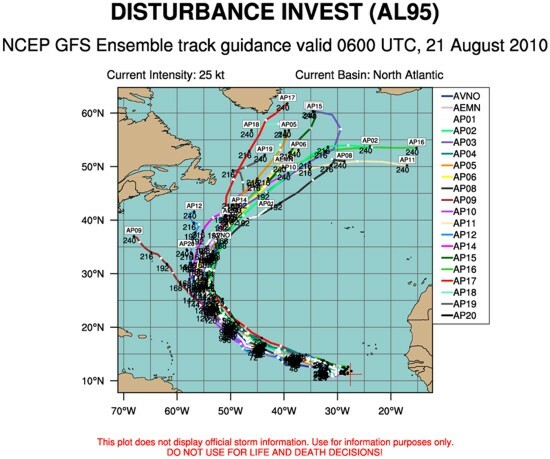 Other global models show a similar track, so it appears highly likely this tropical system will have no impact on the U.S., and only be a concern for ships. It’s quite telling that I’m talking about a tropical system that hasn’t formed yet, and one that isn’t going to impact the U.S. It tells me and everyone else reading this something about this season — it’s not performing to the high expectations set by both the Colorado State forecasters and NOAA. Some of the reasons why haven’t changed. There remains an abundance of dry air across the Atlantic, and wind shear remains an issue. For this disturbance over the eastern Atlantic, these factors are going to make it an uphill battle to achieve beyond weak hurricane status. Even so, this will give us our fourth named storm of the season, keeping things on par with a normal season. At this rate, the hurricane forecasts issued recently calling for 18 named storms this season are in big trouble. But, maybe things will pick up in an incredible way in early September as we approach the peak of the hurricane season. If it doesn’t, people will begin to lose respect for long range seasonal hurricane forecasts, putting the science of meteorology one step behind in the general public’s mind. Speaking of people losing respect for meteorologists, check out Dr. Hansimian’s Hurricane Forecast (the monkey). He’s forecasting 6-8 hurricanes this season. At this point, his prediction is looking better than others! Tornado season continues, tropical storm in Atlantic soon? Don’t forget to submit a comment to the thread: Stormgasm.com T-Shirt and DVD Giveway, in order to be entered in the contest which ends September 10. Satellite image of the Atlantic tropics August 18. You can see a tropical wave near the coast of Africa that computer models indicate will become a tropical storm this weekend. With large, violent tornadoes in North Dakota/Minnesota last week and the rope tornadoes that occurred on Monday in Colorado, we continue to see the results of an active late summer severe weather pattern. In fact, there are two more setups expected this week, one today across South Dakota and Minnesota, and another on Thursday over the same region. The tornado setups just keep coming here in 2010, and every time you think it’s over, another photogenic tornado occurs. There are plenty of reasons why things have been so active as of late, even for the last couple months. But the two main reasons, IMO, are the strengthening moderate La Nina combined with the warm Atlantic Ocean waters (positive Atlantic Multidecadal Oscillation). The La Nina (among other things) has kept the jet stream quit active across the northern Plains, and the warm Atlantic has helped keep robust low level moisture present across the Plains. Both conditions are needed to sustain an active severe weather pattern. The other developing weather story is in the tropics, where computer models are indicating that a tropical storm (or possible hurricane) will develop by the weekend (August 21/22) over the far eastern Atlantic. I’ve talked about the tropics a little over the last couple weeks, and have mentioned that a combination of factors has kept them quiet relative to what has been expected for this season. Those factors, such as dry air, African dust, and the wrong phase of the MJO, haven’t really changed all that much. But, computer models insist a tropical wave coming off Africa will have enough energy to become a tropical storm this weekend. This doesn’t really change what I said recently, that the tropics look quiet and less active than expected by many seasonal hurricane forecasts. Having a Cave Verde tropical storm or hurricane in late August is normal. Actually, we’ve only had one hurricane and two named storms so far. By now, we should have had three named storms with one hurricane. So, this upcoming storm in the Atlantic (assuming it develops) will basically keep this season at a normal pace. I do think dry air and African dust are going to be a problem, but given time and distance, things can change and maybe we’ll see our next hurricane by this time next week. However, for it to have a good chance of becoming a major hurricane, those inhibiting factors need to improve. 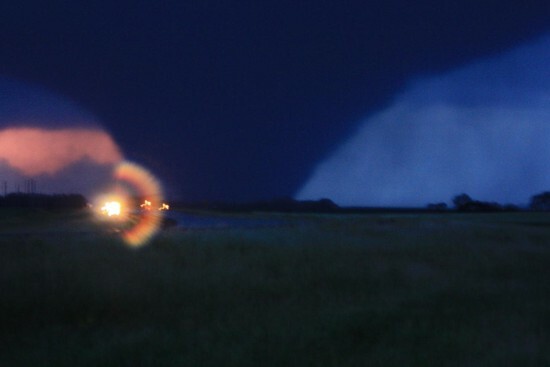 On Thursday, August 12, a violent tornado swept through Bowbells, a small town in northwestern North Dakota. One person was killed and one injured in their automobile Thursday evening, when the nearly quarter mile wide tornado crossed highway 52, east of Bobwells, carrying the automobile several hundred yards. The tornado is also responsible for severely damaging a home in the Bowbells area. The official rating of the tornado from the NWS damage survey team in Bismarck, ND is EF3. Like a broken record, violent tornadoes continue occurring this summer across the northern plains. Each time I make a post like this, I wonder if this may be the last time until maybe the fall that I talk about a violent tornado again. Yet, these events just keep happening. So, it’s reached the point where I’m wondering if the fall tornado season will be more active than normal. It’s clear we have been unable to break the summer pattern of violent tornadoes. And of all people I know occasional tornadoes are common in the late summer across the northern plains. But when you have multiple killer, violent tornadoes like we’ve had, it’s unusual, and representative of a large scale weather pattern. I guess we’ll have to wait and see if this active weather pattern continues this fall. If it does, storm chasers may have an unexpected encore to what most consider one of the best spring storm chasing seasons of the decade. My wife and I found ourselves in Milford, CT just after noon on Saturday. I’ll get into why in a minute. 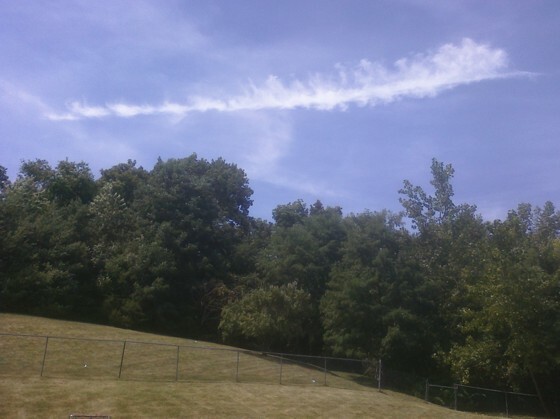 But, we both saw several jets flying in the air above us, leaving interesting looking contrails. 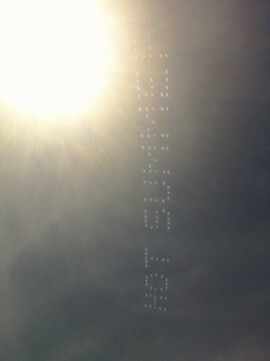 The contrails spelled out ‘HOT SUMMER’. I found this kinda odd. I mean, I know it’s been a hot summer up here and everything, but it’s been in the 70s for the past few days. At the time the picture was taken, it couldn’t have been any warmer than 73 degrees. Oh the irony. 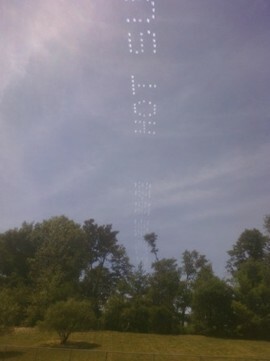 The other issue is why were several jets flying over Milford, CT leaving contrails that spelled out anything at all? I wonder what the point of that was. The whole thing just strikes me as very strange. Anyways, the only reason we were there was because we had gotten up to make a noon appointment and run some errands. Well, on the way to our appointment in Milford, while driving north on the Merritt, we got into a car accident. Yep, some guy in a pick-up truck rear-ended us. And this is so typical of Connecticut drivers. Everyone in front of me was slamming on their breaks and riding each others buts. I wasn’t, so I avoided hitting the guy in front of me. Too bad the guy behind me wasn’t paying more attention. Luckily, the damage to the rear of my car appears mostly cosmetic. Anyways, that was fun. Good times. Where are the tropical storms and hurricanes? It’s mid August and the tropics are quiet. 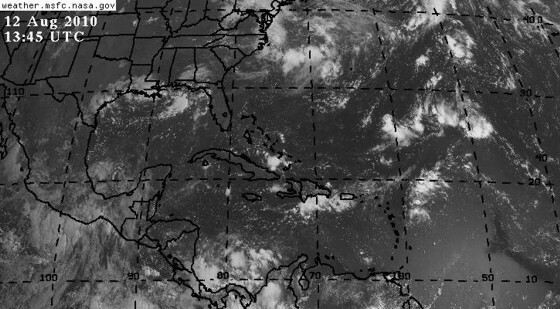 If you look at a satellite image, you might think its May or June instead of nearly the middle of the hurricane season, since it’s hard to find even an area of thunderstorms anywhere across the Gulf, Caribbean or Atlantic Ocean. Based on NOAA’s 2010 Atlantic Hurricane Season Forecast, and Colorado State University’s Forecast, this should be a very active season. Even looking a climatology, we are heading into the more active part of the hurricane season. About a week ago, I event talked about how I thought the tropics would become much more active by now and into next week. Yet, the tropics are silent. So what gives? Well, from what I was seeing last week around this time, the MJO was moving west into the Atlantic Ocean. This was bringing enhanced, large scale, rising motion into parts of the Atlantic, and helping potential tropical waves to develop. That trend was supposed to continue, but it didn’t, as seen quite clearly from today’s satellite image of the Atlantic Ocean. So now we are left with no help from the MJO. Depending on how much more the MJO moves east and strengthens, it could further impede tropical action in the Atlantic for the next week or so. Add to the list an abundance of dry air and upper level disturbances all over the Atlantic basin and you are left with the sound of crickets. But, according to Dr. Philip Klotzbach (the Colorado State Hurricane Forecaster), “it is too early to think that this is a seasonal forecast bust”. He is forecasting 18 named storms and 10 hurricanes this season. So, we’ll have to wait and see what happens. The true peak of the hurricane season begins August 20 and goes through around mid October. That leaves a lot of time to play catch-up. But, Klotzbach’s forecast calling for 18 named storms and 10 hurricanes is going to be really tough to reach, considering we stand at 1 hurricane and two tropical storms so far this season. Although, water temperatures remain very warm, so anything’s possible. But the way things look now, it could be late August or even early September before things really pick up again. That isn’t to say there won’t be a random storm in the open Atlantic before then. But, the big ramp-up in tropical storm and hurricane activity I expected by now just isn’t panning out. We’ll see though, something always changes with the weather, and Klotzbach sure seems optimistic.